Business cards and magnets might be an unusual combination but they actually complement each other and place your business information directly into your client's daily routine. Customized, they allow you to constantly show your business information, front and center, on their kitchen refrigerators. A magnetic business card has the potential to give you repeated business transactions with these clients. 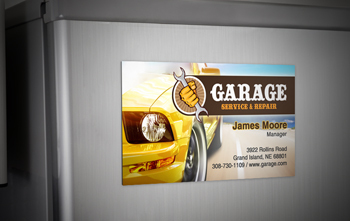 Create custom business card magnets with NextDayFlyers. They are available in a number of sizes that are suited to mimic your own business card. Laminated with a special UV coating, your cards can stay on your customer's fridge or office cubicle for a long time. Choose from a 15 mil., 20 mil., or 25 mil. magnetic strength, depending on your preference. A great design will always appeal to anyone and will ensure that your magnet is put on your customers' refrigerator doors. Make sure that your design is not only appealing but also relevant to your business and to your target market. Include a business card magnet in your promotional freebies. Not only is it a business card with your information on it, but it is also a functional item for posting notes. Engage your customers by putting a short proposition or a call-to-action. This can go hand-in-hand with a strong image and design, and be memorable to your customers. Business Card Magnets is rated 5.0 out of 5 by 8. Rated 5 out of 5 by Save US Pets from Perfection at a great price Exactly what we ordered at a great price and delivered as promised. I’ve use NextDayFlyers for a multitude of projects over the past two years and have never been disappointed. Rated 5 out of 5 by KimM from Excellent Products and Service! Our business has been ordering products from Next Day Flyers for several years. We have always been very happy with the quality of products and turn around time for everything we have ordered. We have ordered a variety of products from business cards and letterhead to promotional flyers and business magnets. We will always use Next Day Flyers for our professional products! Rated 5 out of 5 by Tanfloridagirl from Simple and easy, great product! Easy to order and the product came real fast and turned out even better.